"The Ultimate Valet" includes our Platinum Combined Valet, 3 stage machine polish (paint correction), our Silver Seal Paint protection system, and our Silver Seal Fabric protection. 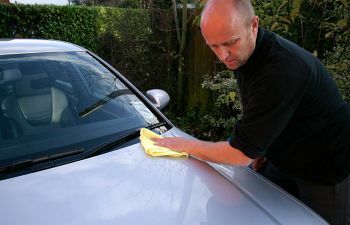 Machine polishing is a great way to improve your vehicles appearance, it will rid the paintwork of swirl marks, which are produced when washing a vehicle with a dirty sponge. Machine polishing will remove minor scratches, and restore the colour and shine to dull, faded paintwork, dramatically improving the shine and quality of your vehicles body work. 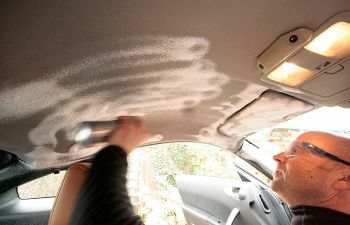 With this procedure we will go over the paintwork 3 times, until the desired affect has been achieved. In this valeting package, we will cover every part of your vehicle interior and exterior, not only leaving the vehicle gleaming inside and out, but also protecting both the exterior paintwork and the carpet/upholstery too. Silver Seal's advanced polymer coating cures to the vehicle finish forming a glass-like bond which acts as a barrier preventing damage from exposure to exhaust particles, chemicals, winter road salt and Solar (UV) radiation. A specially formulated protector is applied to clean paintwork, providing a watertight seal which is impenetrable to precipitation. This invisible second skin protects your paint from rain, sun, sleet, ice and snow, leaving a striking `water bead' effect on the paintwork. 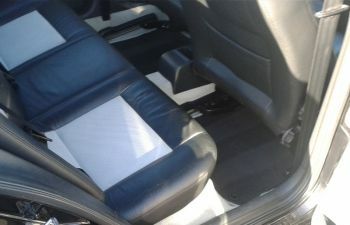 As for the interior, a unique chemical treatment is applied to the upholstery and carpets and is absorbed into the fibres of these materials. This protectant dries to create a waterproof barrier - preventing moisture penetrating the fibres. Spillages like coffee and tea bead off the material like "water off a duck's back", whilst dust, dirt and sticky sweets are easily removed. Once the protectant has been applied, the interior of your car will continue to look as good as the day it was first treated. We will need your vehicle for 2- 3 days for this valet, thus ensuring the perfect result. We start by using Autosmart's Hazsafe traffic film remover as it quickly separates and dissolves road salt, dirt kicked up by your car's tyres, and other grime. Once Hazsafe has been allowed to work, it is then rinsed off with our pressure washer. 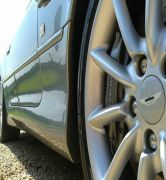 We also clean all the door and boot shuts at this time, as well as the wheel arches and alloys. This process allows us to remove all large dirt particles which could otherwise scratch your car's paintwork during cleaning, we then hand wash the bodywork with a mild car shampoo and then follow up by another rinse with the pressure washer and dry using our drying towels. Following the comprehensive washing process, we follow up by using Clay Bar with Lubricant. This is literally a bar of soft clay which is used in conjunction with a detailing spray. It acts by removing bonded contamination and hard water stains from the paintwork which cannot be removed simply by washing. It is also an essential step in preparing the bodywork for our premium waxes! A standard feature in our Platinum level services; the Clay Bar detail is kind to the vehicle's paintwork and can leave the paintwork smooth. Another option after clay bar, is to machine polish, this is a great way to enhance the vehicles paintwork, before putting on one of our waxes or sealants. To complete that showroom finish, we ensure that all bodywork is clean, not just the parts that are visible when the car is moving! We fully clean your car's door and boot openings (also known as shuts) using Autosmart's Hazsafe cleaner. The cleaning agent is allowed to dwell briefly before being agitated with a stiff brush and is then rinsed with our pressure washer. Don't worry! 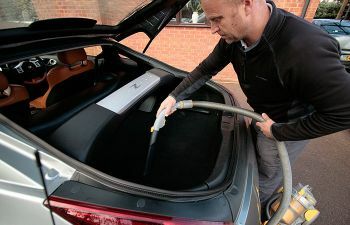 Our staff are fully trained in this procedure and whilst the thought of using a pressure washer near your car's interior may seem scary, it really is the best way to ensure a perfect finish! 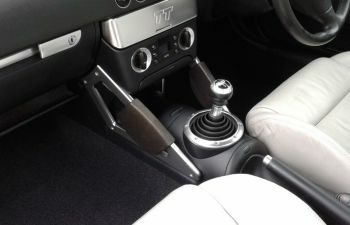 This procedure is included in our Wash and Wax, plus Leather dry. No part of your car is spared our professional treatment! 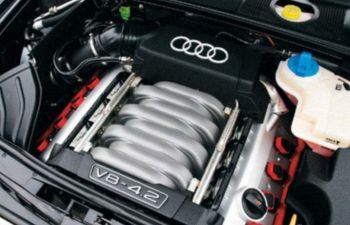 Offered exclusively as a part of our Platinum level service, we fully clean and dress your car's engine bay. Using Autosmarts Plus 10, we gently and carefully spray the solution into the car's engine bay, we then agitate the cleaning agent with a stiff brush and finally wipe down any excess. We then dress the engine bay with Autosmart's Finish to complete the service! This leaves your engine bay sparkling clean and looking as it should! An essential service if you're looking to sell your car! With our Mirror Image polish, which is applied by hand! The magic can be worked into your vehicles paintwork, leaving it with a perfect shine. 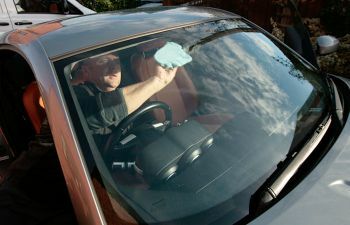 When we have washed and leather dried your vehicle, why not give it that finishing touch. 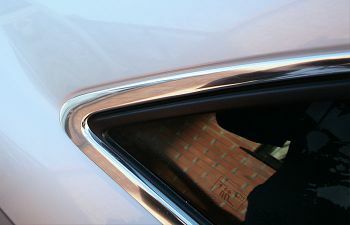 Machine polishing is a great way to improve your vehicles appearance, it will rid the paintwork of swirl marks, which are produced when washing a vehicle with a dirty sponge. Machine polishing also will remove minor scratches, and restore the colour and shine to dull, faded paintwork, dramatically improving the shine and quality of your vehicles body work. 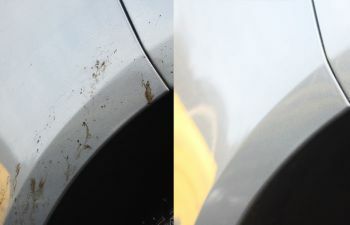 With this procedure we will go over the paintwork up to 2 or 3 times, until the desired affect has been achieved. Before we take on this task, the vehicle must be washed and leather dried, so this is included in the price. Tar can be a blight on a vehicle's bodywork, even after a wash, your pride and joy is almost definately still covered in tar spots! However we at GCVS have the solution! We apply a product from Autosmart, which we leave it to dwell for a minute or so and then we wipe with a soft clean rag to remove all tar from the vehicle's exterior, and even the door shuts too! This is a premium product and we absolutely recommend this to all of our customers! 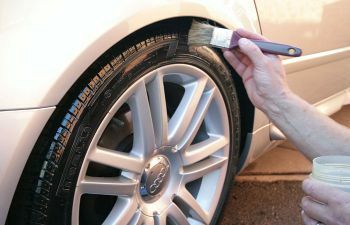 Tyre dressing is one of the finales to the vehicle's enhancement. We apply this with a brush, then wipe away any excess. This is included in our Wash and Wax, plus leather dry. Waxes, glazes and sealants provide the final protection for your newly prepared paintwork. As with many things in life, there is often a compromise - in this case it is durability versus maximum visual impact. 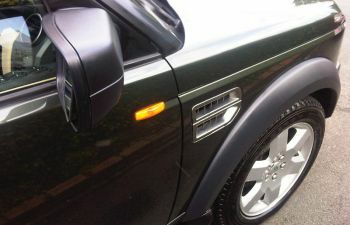 Our standard wax affords a good degree of both, and is included as standard in the Platinum Exterior valet. However, we offer an upgrade to a very high quality wax which is a highly concentrated blend of four waxes including, Carnauba and Candelilla wax, specially chosen to produce a highly durable ‘wet look’ gloss. This will protect your vehicle for up to four months. We also offer a very desirable luxury paste polish, made from natural palm wax. The deep long-lasting lustre cannot be matched by synthetics. Excellent for darker colours and gives protection for up to six months. We have also taken on board, a product called Collinite 426s, this is an extremely high quality Wax, offering up to 12 months protection. 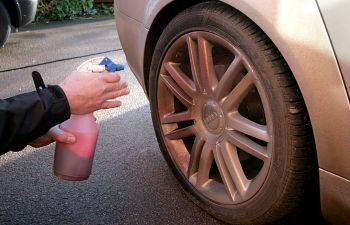 The first stage in cleaning your car's alloy wheels is to coat them with Valet-Pro's Bilberry Wheel Cleaner. This is a PH neutral cleaner which will not damage the lacquer, yet is strong enough to dissolve baked on brake dust and other dirt from the road. We will allow the cleaner to dwell for a few minutes to allow it to work it's magic. At this point we go over them with the pressure washer, to remove all excess dirt and grime. After this is done, we spray the wheels again with the same product, and then agitate the cleaner with a stiff brush to help break up any hard to remove dirt spots and finally finish up using our pressure washer to rinse off the cleaner, leaving your alloy wheels perfectly clean! In addition to your car's wheels being cleaned, we ensure that your wheels won't immediately get dirty again by cleaning out the insides of all four wheel arches. Windows are a very important part of the vehicle, as we need to be able to see where we are going, to say the least! We use a high quality window cleaner to remove all dirt and grime, from inside and out of all the windows. Leaving your glass with no smears! 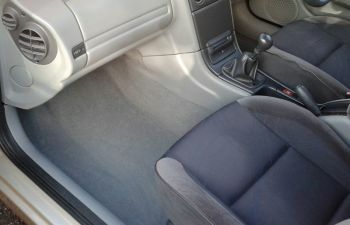 A full vacuum of your vehicle's interior can transform it, as when we vacuum, we vacuum every nook and cranny! Assuring you that there will be no corner left untouched. A very important part of the overall effect of a clean vehicle, and often one of the toughest parts of a vehicle to get clean. A thorough vac, is the best start to achieving that goal. 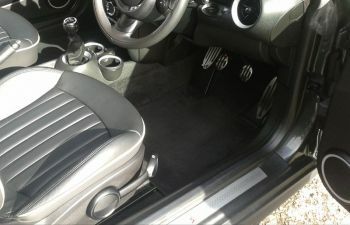 When we clean the dashboard and centre console, we get right into the difficult areas, such as the air vents, around the dials and switches, steering wheel and column, leaving them spotlessly clean! We've chosen only the best fabric sprays that help remove unpleasant smells from your vehicle including wet dog, cigarette smoke and food smells. Our sprays will not stain the fabric and do not create an overpowering smell to mask other scents, instead work to neutralise any unpleasant smells that may exist! Floor mats will be cleaned, with our Brisk Extra at the beginning of the valet, enabling them to be returned, clean and dry, to the vehicle at the end of the valet. Note: This task will be included fo free, if you have ticked the carpets and seats vacuum option. If your vehicle's carpets are in a bad way we can sort that out for you with our full shampoo, which will remove the dirt and grime. Our products will brighten the fabric, and leaving them smelling fresh too! If the carpet has only minor stains, then we can spot clean them with our Brisk foam. A full upholstery clean can give the biggest transformation to a vehicle's interior. We use an Autosmart product called Brisk Extra, and our Wet n Dry vac. This method not only removes the soiling, water marks and stains, but it also brightens and freshens the upholstery. We also have, for the Leather interior, an excellent Leather cleaner, produced by Autosmart, which is mild and gentle, it leaves the Leather clean and supple. We then apply a Quality Leather supplement, to keep the Leather in top condition. The headlining, a part of the interior, is often overlooked. Here at GCVS, this is one area we feel is an important part of the overall experience of owning a clean vehicle. Leaving you with no smears. 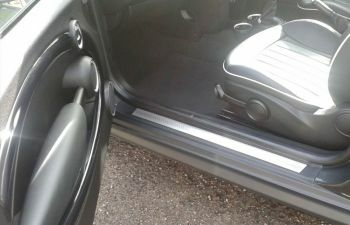 Before we start a valet, we remove all of the contents in the vehicle, and place them in a bag. The bag is then given to the owner to sort out, this is done as we believe that not everything we find is rubbish. Sometimes, there is a small stain on the upholstery, and this doesn't always need a full upholstery clean. This is where spot cleaning comes in! We can remove all manner of stains, leaving your upholstery bright, fresh and clean! 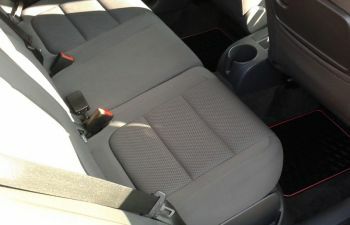 Your vehicle's upholstery will be assessed as to whether a spot clean is all that is required, as sometimes, a full upholstery clean is the answer. A vital part of an interior valet is to clean up all the plastics and then dress them with a non-silicone product, to enhance them. We do not use products that leave a sticky residue, as we believe that this will spoil the effect that you are after. We leave all plastics looking clean and smelling fresh, including the seat runners! How Was Silver Seal Developed? Silver Seal is exclusively researched, manufactured, distributed and guaranteed by Autosmart International and was extensively tested in Scandinavia, where the weather plays a huge part in paintwork deterioration. Silver Seal Paint Protector contains Flourocarbons, a technology originally developed to help protect the exterior of spacecraft. Independent scientific tests prove that Silver Seal Paint Protector lasts longer that any other product on the market. We serve the entirity of Herefordshire and a little beyond too! Please feel free to give us a call on 07792 191 489 if you're unsure we can reach you.